Yesterday was an epically great day. It was fabtacular! It was, in fact, blogworthy, for several reasons. So I want to share my day with anyone who might happen to read this post. The day started with a simple pleasure, a sweet-smelling bubble bath. I had won an eBay auction on some shower gel in a favorite scent that has been discontinued, and my bottle of aromatherapy had arrived in the mail on Monday. My nose, skin and mood were pampered by this simple indulgence, so the day started off great and only got better. 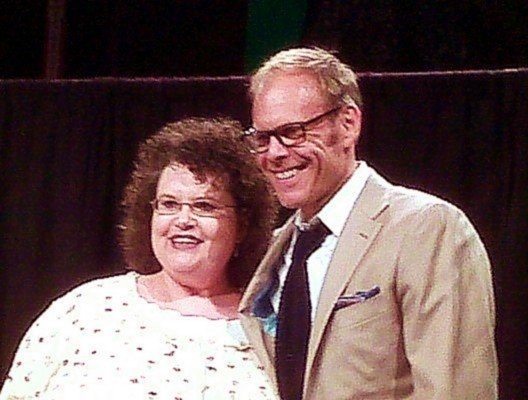 Yesterday was also the much-anticipated day of the Alton Brown Edible Inevitable concert tour stop in Knoxville at The Historic Tennessee Theatre. I looked forward to this for months. Not only did he do his show, he announced a “flash signing” at the venue in the afternoon. I was able to go, get him to sign my Granddad’s antique butcher’s apron and have a photo made and a chat. He seems to be a genuinely nice guy. 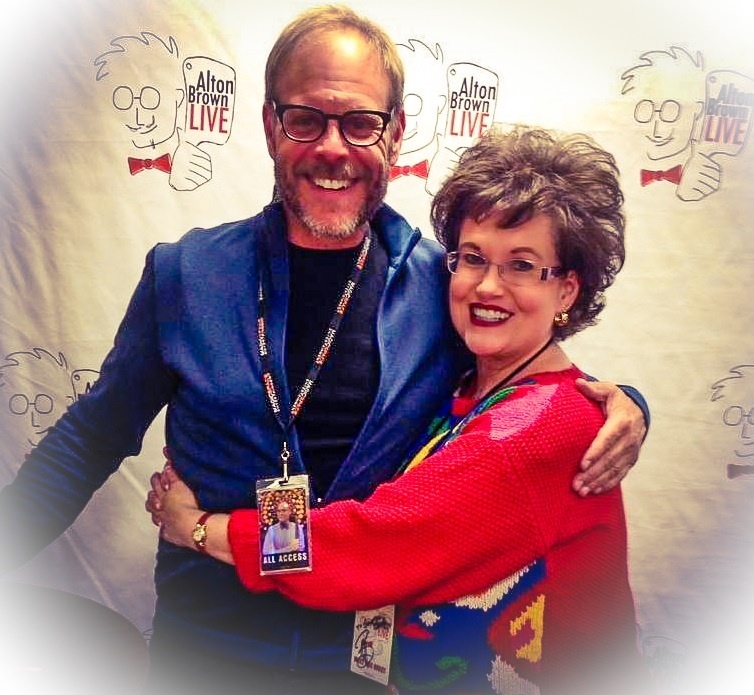 I am a huge fan of Alton Brown, Food Network fixture, creator of the program “Good Eats”, chef, author, food scientist, TV show host and Peabody Award winner. He also plays guitar and is quite the comedian. His live shows have received great buzz on social media with good reason. They are hilarious! The tickets went on sale the day after my chorus and I arrived in New York City last June for our Carnegie Hall performance, which I wrote about in previous posts. At breakfast in the diner before our first rehearsal, I was freaking out and melting down because I was unable either by phone or on the Web to get through to any site or venue to purchase show tickets. A flurry of texts and e-mails to Sweet Pea followed, and with some effort, he was able to procure tickets, FINALLY. So I was able to relax and enjoy the rest of the New York trip and focus on the music and memories being made there, while anticipating the Alton Brown show coming in the fall. I had met Mr. Brown 4 years ago when he was on-site at work for that year’s United Way kickoff. I still can’t believe that whoever planned the event managed to keep it quiet until he was actually on the premises. I had the chance to meet him and chat, and have a photo with him. The one I am sharing here is from my boss’s Blackberry. It was also manicure and haircut day. Again, simple indulgences that can do wonders for a girl’s mood, self-esteem and sense of well-being. My friend, “Queen” Elizabeth, introduced me to the place I now go to get my nails done, and as it happened, yesterday she had an appointment scheduled not long after mine. So visiting with her was an unexpected treat as we both had our hands transformed by the experts at the nail salon. Elizabeth is a source of wonderful positive reinforcement and a bubbly friend, a joy to be around. Seeing her yesterday was a sweet surprise. From there it was haircut time with Brianna, who always gives me cute hair and makes me feel good about myself. I think a good hair person is as important as a good doctor, and for many of the same reasons. They fix a problem and make me feel better. After the haircut I had a little time before the show, so I was able to go by Lola’s and check on the house. I’ve been going by there about once a week just to make sure things are OK. When I got out of my car, I saw a small downy feather floating down across her front yard just a few yards away from me. I was rooted to the spot as I watched its slow-motion descent to the ground instead of chasing it. Once it landed and I was able to snap out of my haze, I did try to find the feather on the ground, but I wasn’t able to. I think it might have been Lola’s way of letting me know she was with me, because I felt her presence as I watched that feather floating through the air. From there I went to Pizza Palace for spaghetti and a t-shirt (the shirt is something I’ve been trying to get for almost 2 years and has eluded me for whatever reasons!) I picked up one for me and one to take to Alton Brown as a souvenir of his stop in Knoxville. He seemed happy to receive it and asked me where his pizza was! The show was hilarious and I laughed until my face and throat were sore. Today I’ve been able to rest and enjoy a quiet day snuggling with Our Boy Roy, listening to gentle rain and reading. In the mail today I received a wonderful surprise, a “mailable hug” from my talented friend Katie Jo. 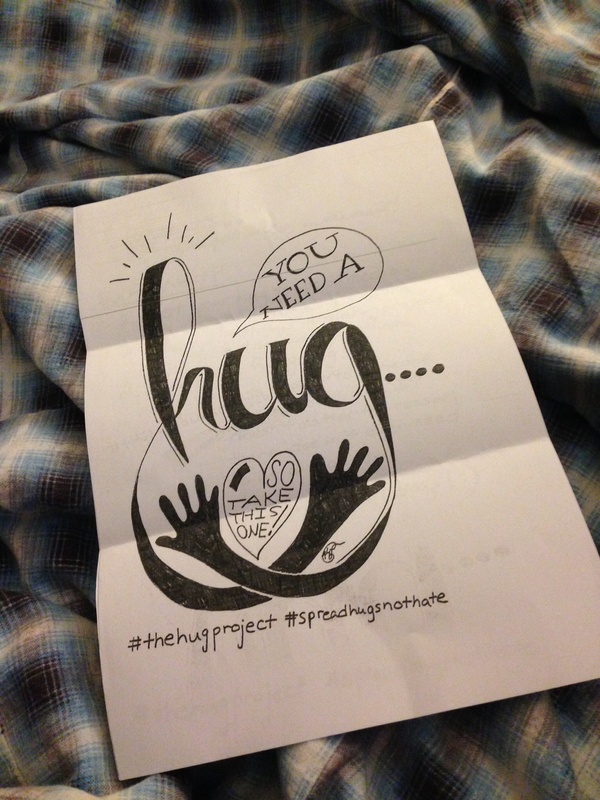 She has started a campaign of sharing hugs via the mail and social media. I am sharing my hug here and in every other way I can. Share this hug with everyone you know. I think we ALL deserve a great day. You look super. I too have lost 64 pounds . Congratulations to you! Weight loss is hard no matter how we go about accomplishing it.